It almost seems impossible that we went from 50 degrees Fahrenheit to freezing and back out again last week. Especially as I sit inside today avoiding a wind-chill of 7 degrees F. below zero. 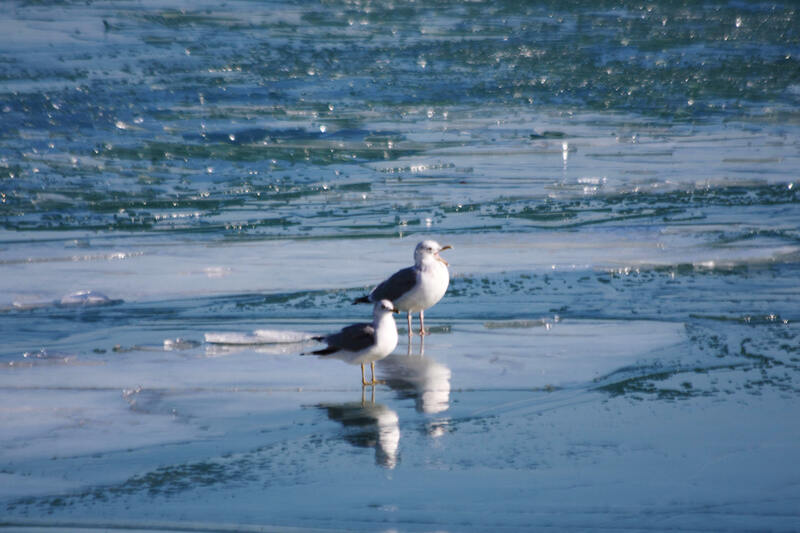 I visited the lakefront almost every workday this past week, monitoring the thaw. 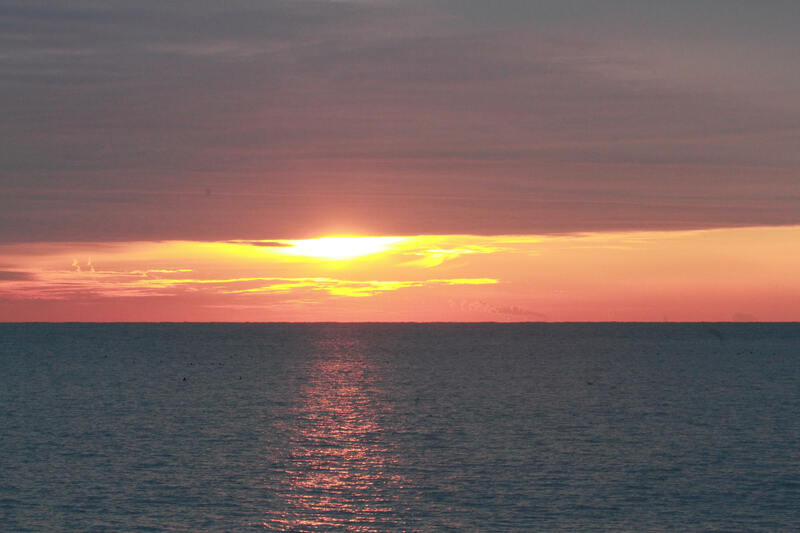 Although the weather in Chicago is still a primary topic of conversation, it is clouded by the perception that with climate change, anything could happen and whatever it is, it will most likely be weird. 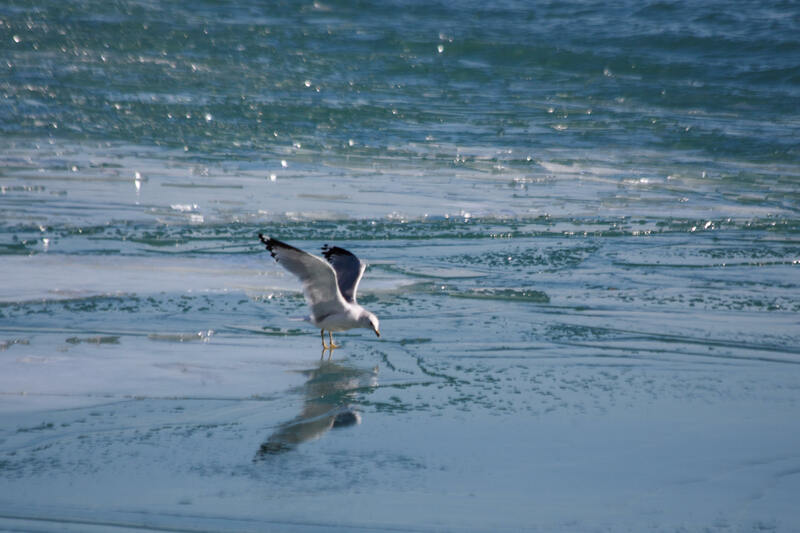 Here is a Ring-Billed Gull testing the ice closer to the shoreline. 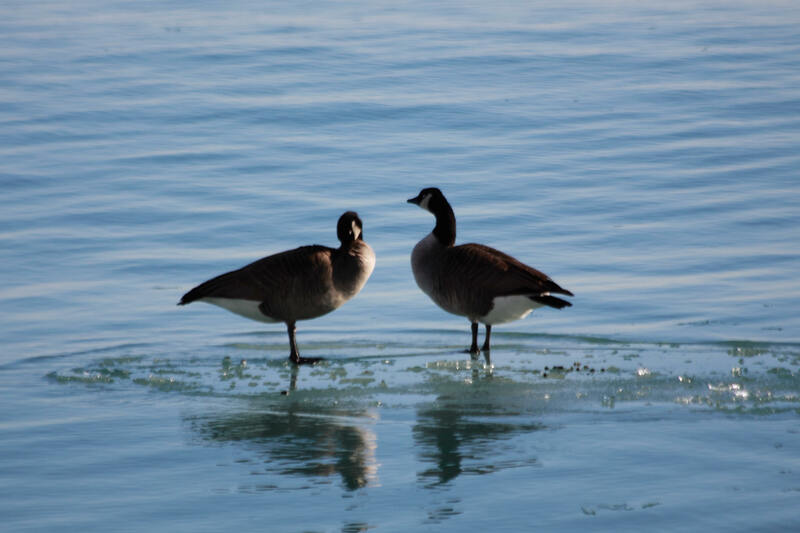 A little piece of ice made for two Canada Geese. And here’s the same Ring-Billed Gull joined by a Herring Gull (yawning in this picture), who was kind enough to stand close enough to offer a credible size comparison. A couple days later, the ice had melted enough to accommodate Red-Breasted Mergansers closer in. Friday morning I went down early before work, and I always see the sun just starting to come up over the lake before I get to it. 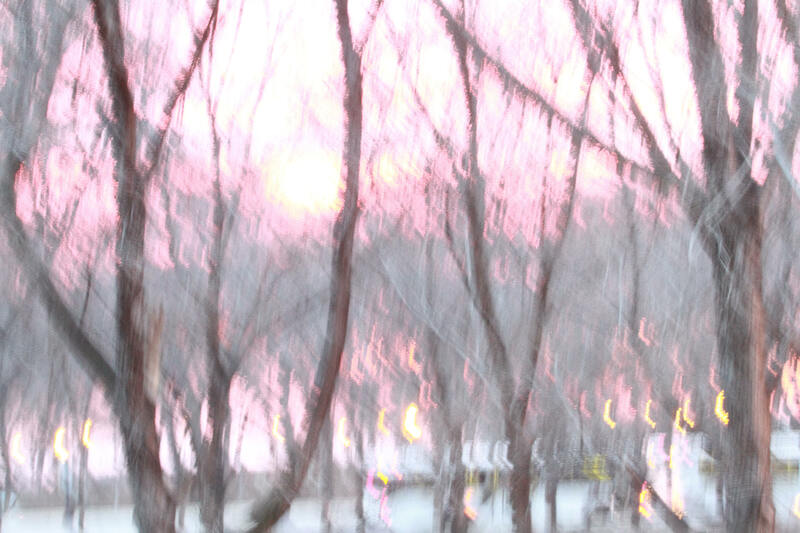 For the heck of it I stopped in the breaking dawn to see if I could get a picture of the sun coming up through the trees. Without a tripod this shot was never meant to happen, but I kind of like the surreal effect anyway. 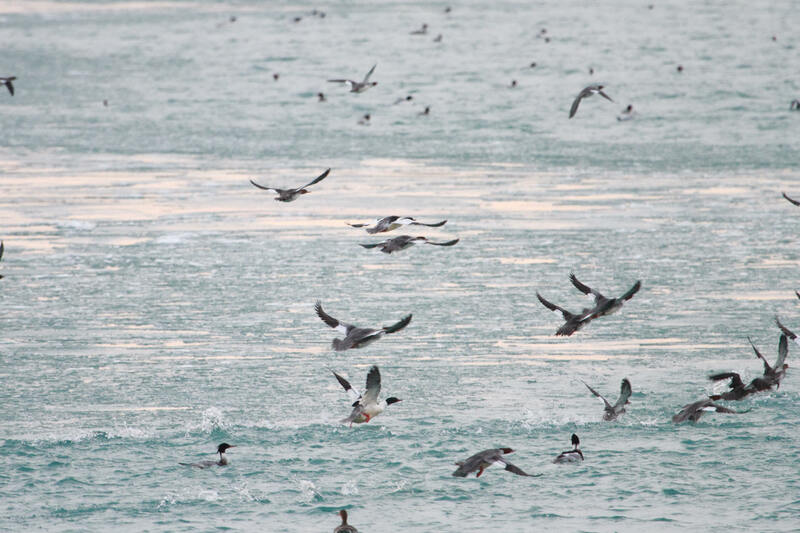 and several Common and Red-Breasted Mergansers in flight. 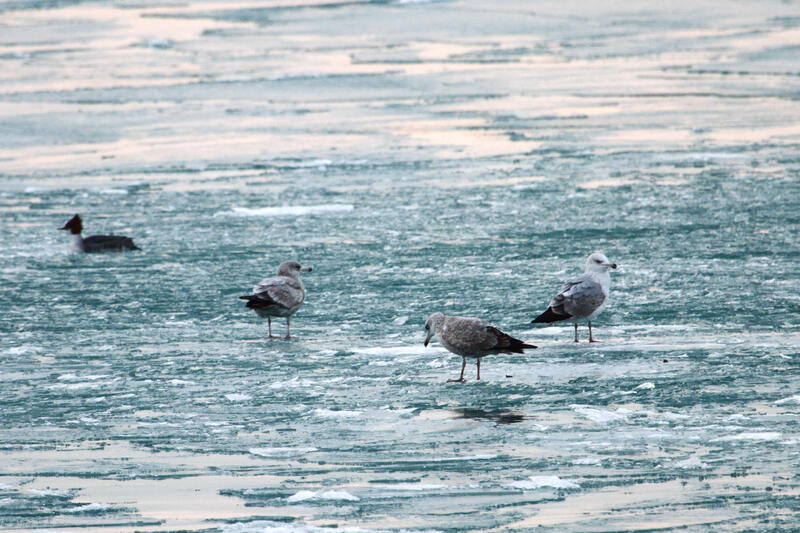 These three Herring Gulls in various stages of plumage complement the ice in various stages of thaw. 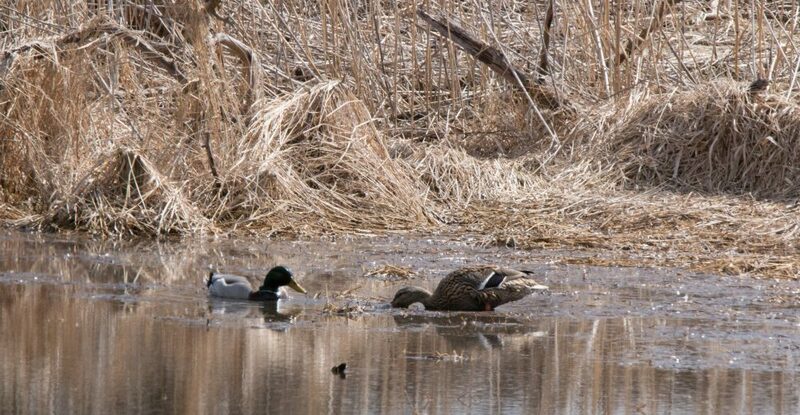 That’s a female Red-Breasted Merganser in the background. 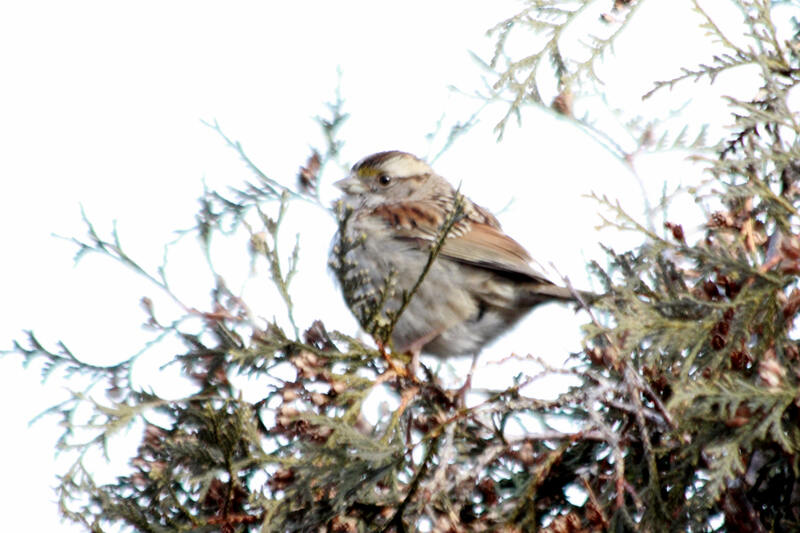 And here’s the White-Throated Sparrow who hangs out in the hedges by the yacht club. 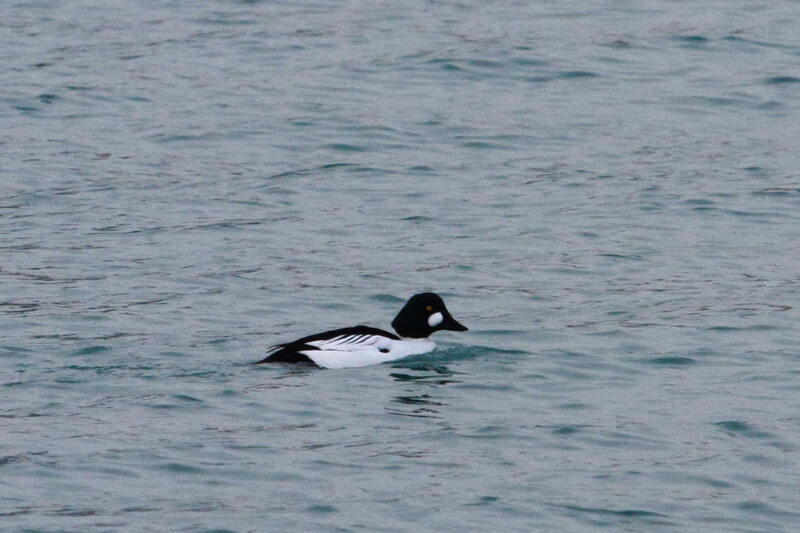 This entry was posted in birds, Crows, photography and tagged Canada Geese, Common Goldeneye, Common Mergansers, Herring Gull, ice, Lake Michigan, Red-Breasted Mergansers, Ring-Billed Gull, sunrise, White-Throated Sparrow by Lisa Rest. Bookmark the permalink. Nice pics. The white throated sparrow is cool. I have a family of them (about 6-7) living in the hedges in the front of my house. Thanks for your comment! Lucky you to have a whole group of White-Throated Sparrows where you live. They’re among my favorite birds…the first ones I noticed hanging out with House Sparrows years ago when I first got into birds and realized these had “racing stripes” on their heads. Hey Bob, thanks! Yeah, I guess it’s always worth trying the impossible just to see what happens. Especially when there isn’t much else going on in my neck of the woods this time of year. 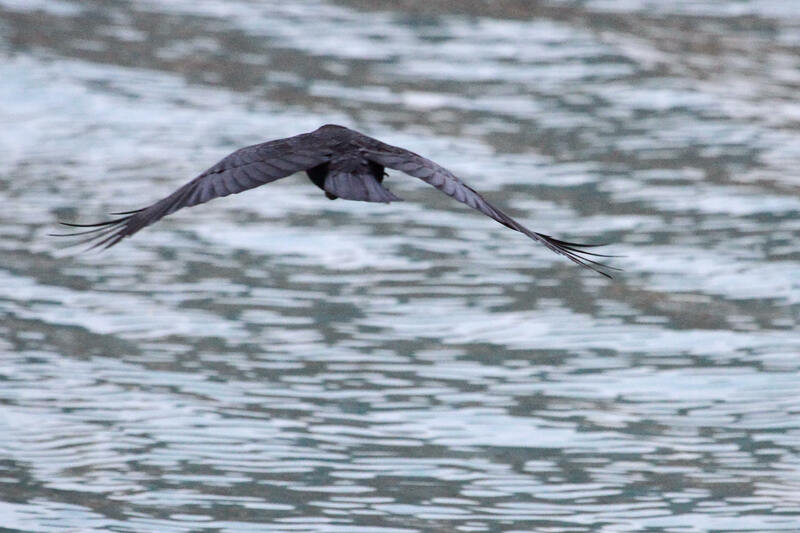 love the breaking dawn…it has a misty aura about it..and the bird photos are delightful.